Authors: L. Chomiuk et al. Supernovae can traditionally be broadly divided into two categories: the explosion of a white dwarf as it nears the Chandrasekhar mass (Type 1a) and the collapse of a massive star’s core (Type 1b, 1c and II). Subclassifications on the basis of absorption lines and the shape of the light curve are also made. Starting in 2005 with SN 2005ap, however, astronomers began to detect new transients that are far more luminous than previously-known supernovae. With brightnesses ten times those seen in Type 1a’s, these new supernovae have been dubbed “ultraluminous supernovae.” Tony introduced us to these supernovae a while back. The paper he reviewed discusses possible energy sources for these explosions; in particular, they are too bright to be powered by the mechanisms we thought fueled supernovae. The first ultraluminous supernovae (SN 2005ap) and a handful of others were found to have similar characteristics and grouped together as “SCP 06F6-like objects,” after another of the supernovae in the group. Recently, the Pan-STARRS1 Team has added two more of these supernovae to the mix. Pan-STARRS, the Panoramic Survey Telescope & Rapid Response System, is systematically observing most of the night sky that it can see. One part of the observing program is the “Medium Deep Survey” which revisits ten patches of the sky nearly every night and is designed to be sensitive to Type 1a supernovae; it was in the MDS that the new supernovae were found. The first object, PS1-10ky, was near peak luminosity when observations of its field began in June 2010 and was observed until it had faded, three months later. The second object, PS1-10awh, was caught as it was first beginning to brighten and monitored until it could not be observed by the Pan-STARRS telescope. By combining the data for these two new supernovae, the authors of this paper are able to present the full light curve of an SCP 06F6-like supernovae at multiple wavelengths. The stitched-together light curve is shown below. The authors explore three possible explanations for ultra-luminous supernovae. The first is the decay of radioactive elements synthesized in the explosion, which is the mechanism that powers Type 1a supernovae. In agreement with previous work, Chomiuk et al. find that this physical mechanism cannot fit the data. 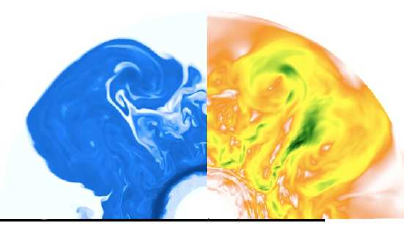 The second possible scenario is the rapid spin-down of a magnetar and the third that the expansion of a supernovae into dense gas results in the rapid conversion of the supernovae’s kinetic energy into radiation. Both of these two hypotheses can fit the data, albeit with extreme requirements: in the second case, the magnetar must be spinning very rapidly and in the third case, the progenitor star must recently have experienced significant mass loss. Of course, SCP 06F6-like supernovae are quite rare (something like 1 of every 10,000 supernovae) so it is plausible that such extreme conditions are required. paper says pan-starrs is currently discovering ~1 such source each month; claimed rate is 1 in 10,000 SNe — pan-starrs is seeing 10^5 SNe every year?! holy moly. The rate is volumetric, i.e., the number of SNe per volume. Pan-STARRS finds many more SCP06F6-like SNe relative to other SNe because they are brighter. That is, the volume in which one can detect SCP06F6-like SNe with Pan-STARRS is much larger than the volume in which one can detect other types of SNe. As a side note, although SN 2005ap was discovered first, it was not identified as being very luminous until after a paper was written about SN 2006gy*. Given that SN 2006gy was the first SN identified as having a very high luminosity and started the discussion of what can power such a luminous explosion, it is appropriate to call it the first “ultraluminous” SN. aaah volumetric rate, should’ve known, brain froze. so it turns out to be around ~10^-8 Mpc^-3 year^-1.